These days, “minimalist” tends to refer to lo-fi garage rock. However, Peter Bjorn and John have truly reduced their sound down to its vital parts. Album highlight “Eyes” exemplifies this, carried by a strong bassline and crisp percussion. On “Second Chance,” the guitars sound crunchier than what we’re used to hearing from the Stockholm group. In his interview with American Songwriter, bassist/keyboardist Björn Yttling has expressed the band’s affinity for garage rock, and it shows. Through their Scandinavian pop filter, the results are much cleaner-sounding, but no less refreshing. The band is able to dispatch short, fast-paced cuts with all the panache of younger artists–and much more discipline. At well under two minutes, “Black Book” fully delivers, fuzzed-out but tightly controlled. The rollercoaster “Breaker Breaker,” penned by drummer John Eriksson, segues into “May Seem Macabre,” a pure, smooth breather. Artists are constantly evolving, but Last Night On Earth is not so much growth as it is an attempt to be something that Noah and the Whale are never going to be. There is no cheeky wink and nod that lets listeners know that the band is in on its own joke, that they know they’re out of place. This is not where power ballads belong, both in terms of the band’s previously established sound and the actual execution. Cold War Kids’ third full-length effort Mine Is Yours comes packaged with a John Cassavetes quote about a volatile marriage, setting up the album’s thematic thread. Whereas their previous releases (2006’s Robbers & Cowards and 2008’s Loyalty to Loyalty) took on subjects from suicides on the Golden Gate Bridge to being a prisoner on death row, broken relationships and their effects are the focus on this album. It’s a move that represents aging, but doesn’t necessarily mean progress. I also recently photographed Yuck and Smith Westerns for American Noise. I haven’t totally dug into it yet, but I’m regretting not listening to Foals’ Total Life Forever sooner, it’s a great album. Vampire Weekend covered “Fight For This Love” for Live Lounge today, and I would be lying if I said I hadn’t spent a significant part of this afternoon watching Girls Aloud videos and remembering how much I enjoy them. 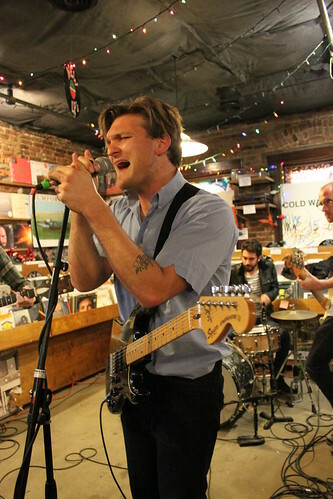 I had the pleasure of seeing Cold War Kids at Third Man Records on Sunday, and the new stuff sounds great. Rites of Spring is Vanderbilt University’s annual spring festival. They usually manage to book a fairly strong line-up with some pretty big names, but the actual combination turns out pretty strange, genre-wise. Case in point: last night Cold War Kids and Phoenix opened up for…Drake. There is the sentiment that all California bands owe something to the state on some level. With Cold War Kids, it feels innately apparent, but difficult to pin down. Regardless, they are some of the finest raconteurs in indie rock. Every song tells a story, with clear images of desperation and disillusionment. Their piano-driven sound is soulful, gritty, and sharply percussive. New songs like “Audience” and “Santa Ana Winds” sounded just as good alongside old favorites “Hang Me Up To Dry” and “Hospital Beds.” “Saint John,” from 2006’s Robbers and Cowards was a particular standout–live, that bassline is incredibly filthy and downright nasty in all of the best possible ways. Ultimately, it was Cold War Kids that I absolutely needed to listen to when I got home from the show. I can’t say too much about Phoenix other than that they are very talented live performers. Awesome dance party? Awesome dance party. The set focused on songs from 2009’s runaway hit Wolfgang Amadeus Phoenix, opening with “Lisztomania” and closing with an extended version of “1901”, though the rest of their decade-long career was not neglected. Frontman Thomas Mars’ look of perpetual surprise and self-conscious hair tousling are unexpected from someone who’s been a professional musician for so long, but maybe that’s part of the charm. They’re French, they’re fashionable, and they have the chemistry and ability to mix things up that only comes with time. As for Drake, I honestly started laughing multiple times during his set, and I haven’t even seen more than a couple of episodes of Degrassi, which he used to be on. (It was explained to me that his character, Jimmy, was a basketball player at the school until he was paralyzed in a school shooting.) Due to the fact that he was an actor on a cheesy teen drama, Drake is faced with the dilemma of acknowledging that people don’t take him seriously versus trying to force his audience to take him seriously. Unfortunately, he obviously chooses the latter. His stage banter sounded like he had a quota for the minimum amount of time he had to spend talking about stereotypical rapper activities and Lil Wayne going to jail. He mentioned groupies and picking up girls so many times that, if he didn’t take himself so seriously, he would have gone into “Ladies of the World” from Flight of the Conchords. I have no problem with gratuitous profanity, but it seemed like he was keeping a mental tally of every time he swore. If Michael Cera put the same amount of effort into acting that Drake puts into trying to seem like a legitimate rapper, then Cera would be in Scorsese films. The secondhand embarrassment from Drake’s attempts to prevent the audience from thinking, “Where’s your wheelchair, Jimmy?” was so strong that you could throw guest Birdman’s giant watch at it and it would bounce off. That being said, Drake can actually rap, but his antics make him seem like a pathetic try-hard.